Thank you for participating in my two webinars this month, Get Unstuck Now and Eliminate Procrastination. I love doing these EFT Tapping intensive free webinars so people can move forward in their lives with clarity and confidence. The first live coaching call for the Mastering The Yes Code program was today. We have an awesome group from around the world coming together to identify and clear the blocks we all have to finding our next YES. Is it too late to join? Not at all – although it will be too late in a week. The first live call just happened, and the replay is already available to members. Treat the replay like it’s live… give it your full attention… and you’ll get a LOT of value from tapping along. You can learn more and join here for $497. Will you do this again? The Yes Code™ is my trademark and core to my work in the world. It’s an extremely effective combination of a guided process and EFT Tapping to clear emotional blocks and anchor new success-oriented habits. So YES, there will be more about The Yes Code in the future! That said, the timing for next round of this unique program has not yet been determined. How can this help me professionally? Knowing your Yes and being free of blocks to taking action is helpful in every profession, of course. Indeed, being able to take effective action is the hallmark of being professional. For those who manage or coach others, these steps can transform the relationship and supercharge your results… and allows us to help ourselves and others get back on the bike when they fall off (see Module 6). I’m not ready for this program yet. Do you have other suggestions for programs I can do on my own? 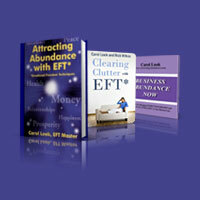 All the programs in my Abundance Store help to clear blocks, get clarity, and improve your vibration. For many people the Eliminate Procrastination Program (which is available right now for $97) is an excellent place to start. If you’re overwhelmed with too much stuff, Clearing Clutter From The Inside Out is the place the start. Again, thank you for engaging with me this past month. I’m excited about what is to come as more people become skilled at finding their next Yes and putting their clarity into action! If you do want to join us for Mastering The Yes Code, please do so before May 8th by clicking here for a single payment or here for 2-payments. If you have any questions I’ve not answered here, please reply and ask. I’m at Carol@Carollook.com.